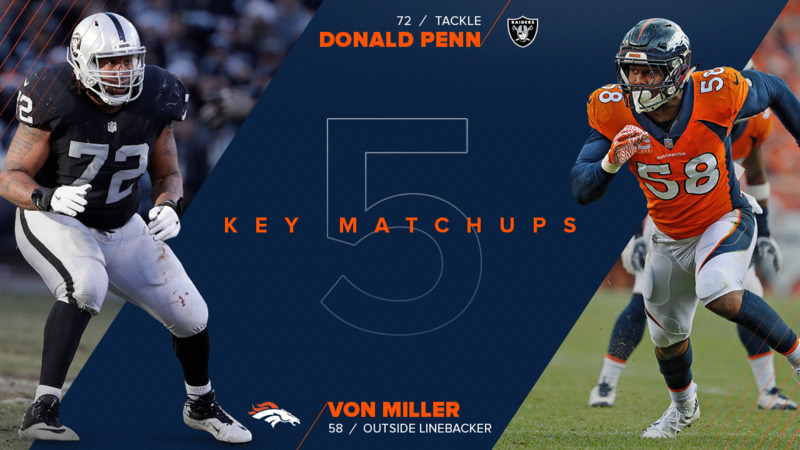 Von Miller versus Donald Penn pits two multiple-time Pro Bowlers against each other, but that's not the only matchup to watch on Sunday. Miller’s 2018 season got off to a fast start in Week 1 against the Seahawks. He racked up seven tackles, three sacks, two forced fumbles and one fumble recovery. He now has 86.5 career sacks, inside the top 50 all-time. Last year, Miller had 1.5 sacks in two games against the Raiders, and he’ll be looking for more success against one of the league’s better offensive tackles. Penn is a three-time Pro Bowl selection, including each of the last two years. Penn has been the ultimate iron man at tackle, missing only two games in his career, which started back in 2007. At 35 years old, he’s still getting it done at a high level. "He’s a strong guy, a big guy and one of the better tackles in the league," Miller said Thursday. With a rookie, Kolton Miller, at left tackle, could we see the Broncos' star pass rusher find times to take advantage of that matchup as well? We’ll know soon enough. With 10 catches for 135 yards and a touchdown, Sanders posted one of his finest stat lines as a pro in Week 1. The veteran wide receiver built great chemistry with quarterback Case Keenum throughout the offseason, and that was on display in the win over the Seahawks. After matching up with Seahawks rookie Shaquill Griffin last weekend, he’ll face another young player in Week 2. Conley was a first-round pick in 2017, but he didn’t play much last season. This year, though, he’s a starter for the Raiders, and his matchup with Sanders is a crucial one. If Sanders can win it more often than not, Keenum should be able to get him involved early via short passes and then look to get the ball deeper down the field as the game progresses. Davis produced a team-high eight tackles in Week 1, and the Seahawks ran for just 64 yards, their fewest since Week 8 of last season. Davis, who was named a team captain before the regular season, will have his hands full with Lynch, though. The 5-foot-11, 215-pound bowling ball had 49 total yards and scored the Raiders’ only touchdown in a Week 1 loss to the Rams. "He’s a great runner, and you definitely have to bring it when you tackle him," Davis said Wednesday. Lynch is tough to bring down, as he proved on his 10-yard score on the game’s first series, but if Davis and the rest of the defense can limit him, that puts more pressure on quarterback Derek Carr and the passing game. The Broncos had a tough time covering Seahawks tight end Will Dissly, who recorded 105 yards and a score on just three catches in Week 1. The task doesn’t get any easier with Cook coming to town. He’s coming off a nine-catch, 180-yard Week 1, tied with Michael Thomas for the most receiving yards of any player on opening weekend. "He's definitely a problem," Defensive Coordinator Joe Woods said Thursday. "We’re going to have our hands full for sure." Cook is a big, athletic target for Carr, so Stewart will have to be up to the task. He registered three tackles and a half-sack against the Seahawks. In his Broncos debut, Veldheer impressed on the right side of the offensive line. The veteran tackle was part of an all-around solid performance from the offensive line, which paved the way for 146 rushing yards and allowed just one sack. Veldheer, though, faces a tough challenge on the other side of the line of scrimmage in Irvin, who had eight sacks last year. With former All-Pro Khalil Mack traded to Chicago, the bulk of the pass-rushing responsibilities falls on Irvin’s shoulders. He had the team’s only sack against the Rams, and he also forced a fumble.